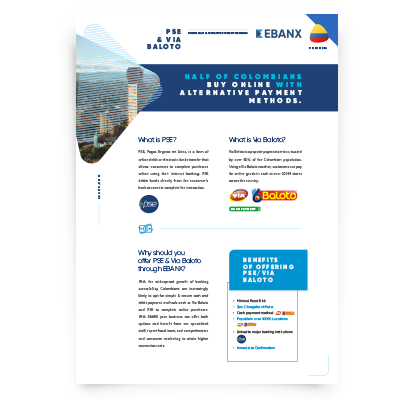 In this white paper you will understand why Colombian consumers doesn't use credit card and also will know how to access more than 42M of new consumers by offering PSE and Via Baloto as a payment method. With the widespread growth of banking accessibility, Colombians are increasingly likely to opt for simple & secure cash and debit payment methods such as Via Baloto and PSE to complete online purchases. With EBANX your business can offer both options and benefit from our specialized staff, expert fraud team, and comprehensive end consumer marketing to attain higher conversion rates. Why should you offer PSE & Via Baloto through EBANX?